What support is available to people with disabilities and their families, and what could make their lives easier in the future? Disabilities bring multiple hardships and difficulties to people living with disabilities, and to their families. What challenges do they face on a day-to-day basis? We asked Nikki, a mother of a boy living with cerebral palsy, to share her thoughts on this subject with us. Here’s her story. Chase. Strong and always smiling? Being a busy mum of three young children poses many challenges. But being a busy mum of three when one of those children has additional needs is even more tricky! My eldest son Chase suffered a birth injury starving him of oxygen. As a result of this, Chase now lives with a severe form of cerebral palsy. 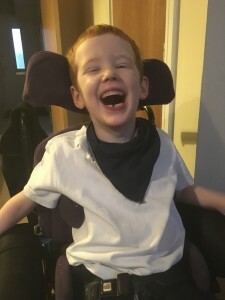 Chase’s type of cerebral palsy means he is unable to verbally communicate, has almost no fine motor skills, uses an electric wheelchair to get around and needs assistance doing most activities. Living day-to-day with such a severe disability is challenging. Chase is currently only 7 years old, which means like most mums I’m doing most of his housework for him. However, when Chase will be of an age that most children will be doing their own housework, he will still require someone to help him. Despite his many limitations, my son is fiercely independent and wants to do as much for himself as he can. Recently, I’ve been thinking about how Chase would be able do simple tasks like washing his own clothes. Is there any help for disabled people to face their challenges?! If there’s one thing that Chase can do independently as part of the process of looking after his own clothes, it’s putting them in the washing basket. This is currently one of Chase’s household chores that he has to do everyday. Chase loves to feel like he is contributing to the housework. He struggles to pick up the clothes and then get them in the washing basket but does manage with a lot of perseverance. Sorting clothes is possible but a task that would take a long time for someone with a disability like Chase’s to do. Putting clothes in a washing machine is easy, right? Not for Chase! Again, his fine motor skills let him down and being able to pick up each individual piece of washing out of the basket and place into the machine is a difficult and laborious task. Chase doesn’t even have the strength in his arms to be able to securely shut the washing machine door. The next challenge would be to start the washing machine. Chase is physically unable to turn the washing machine programme selector. Even pushing buttons can be a tricky task. Chase’s arms are quite shaky, meaning he would most likely hit the wrong button and possibly put the wrong washing programme on! Easily pouring powder or liquid into a drawer is something a lot of us do without realising the complexity involved. Not being able to lift heavy weights or accurately pour means that, again, this is outside of Chase’s physical capabilities. Unloading the washing machine and hanging clothes up to dry would provide the same difficulties as loading the washing machine would. It’s not just my son with these physical difficulties. There is an estimated to be over 10 million people in the UK who are disabled. 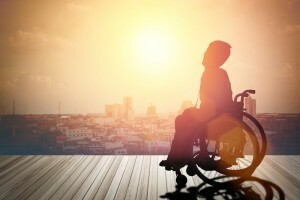 Although everyone’s limitations will be different, there will be many others that struggle with their daily household tasks. From washing to cleaning or preparing food. Many people will either be struggling or relying on friends and family to help them with these tasks. Persons with disabilities have the right to enjoy life at full! So what solution is there for someone who wants to be independent as much as they can. Chase really struggles with physical tasks but is a whizz with technology. Chase can use almost any computer by using specially adapted equipment. This means that Chase would be able to access independently services like Laundrapp. A service like Laundrapp removes all of the major physical difficulties for someone who is disabled to get their washing done. Having a service available like this is life changing for so many disabled people. Before I had my son, I regularly took for granted all the simple tasks I do on a daily basis. I want him to be able to lead as independent life as possible. Being able to order your own washing to be done online is an amazing concept and I’m excited how services like Laundrapp will enable my son and others to lead as independent life as possible. This article is with thanks to a super brave mum, Nikki, who’s looking after a family of 7! 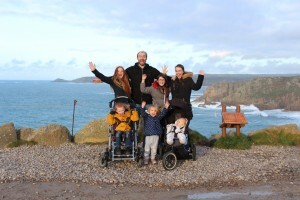 Please visit Nikki’s blog www.glamandgeekymum.com to read tips on finding ways to enjoy family life with a child who has a severe disability, about bringing up children, technology and many other topics, and take just 1 minute to nominate her for the Brit Mum’s Brilliance In Blogging awards. Nominations close on June 7 at 23.59. Thanks!